What color are the thousands of USPS mailboxes in your city? What about the millions of stop signs in the US? They’re all the same, but not by chance. In fact, figuring out those colors has been a 70-year process. This week, the Washington Post published a quiz asking readers to identify the right hue for everything from highway signs to OSHA safety vests. Core77 pointed out that the answers were drawn from something called the Federal Standard 595C, a government-mandated list of 650 colors that dictate the colors of just about every object, building, vehicle, weapon, sign, or piece of infrastructure controlled by the Federal government. So when did this system emerge? Who created it? And why? During World War II, the US government realized it needed to standardize the paint colors it used across both theaters. For example, the color of fighter planes’ insignia became a serious liability: As the Navy changed the colors of its planes, it could be tough to tell an Allied plane from a Japanese one. “the red circle in the US national insignia was even more likely to be taken for the Japanese ‘meatball,’” explains Naval historian Tommy H. Thomason. Plus, the US military was spread across an entire globe—making sure its equipment matched wasn’t just a safety issue, it was pretty much impossible in far-flung locales. “[The] problem of providing exact color specification to an equipment subcontractor on the other side of the World became manifested itself with obvious clarity,” says ColorServer. What could be done? The government began to create color chips—each with an assigned number—to help contractors get the colors just right. And when the war ended, that system became law. 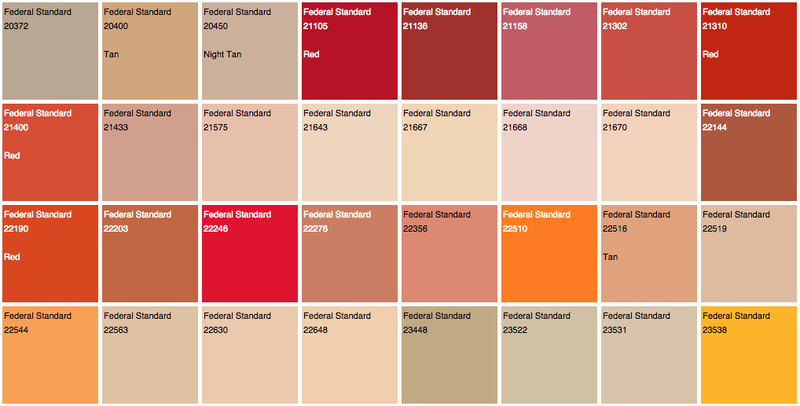 The newly created General Services Administration created an index that would later become known as the Federal Standard 595C—a library color samples that at first included just a few hundred colors, though today it includes 650. In October 2001, F.S. No. 33696, a shade of yellow, was the color of the 2,000-calorie plastic-wrapped food-aid packets that American forces dropped on Afghanistan. A very similar shade was used on the soft-drink-sized bomblets that the U.S. military also released from above. [...] “Do not confuse the cylinder-shaped bomb with the rectangular food bag,” an American psy-ops radio broadcast reminded the local population. It’s interesting to note that Federal Standard 595C was one of many other color systems that sprang up around the same time. Pantone’s own index was developed in the early 1960s, spurred by similar issues but from the commercial printing and production world. These systems were harbingers of modern globalization: You only needed a color index if you were dealing with producing many objects across many different locations and they all needed to look like the same product. In a weird way, paint has closely followed the progression of human civilization—from the hand-mixed natural pigments of thousands of years ago, to the tightly-regulated chemical compositions that blanket our world today. Go check out Beck’s great story from 2011 if you want to learn more about 595C.